Welcome to our photo album of Junction City's unique and continuing events. It's been said that a picture is worth a thousand words (450, accounting for inflation), so that's what you'll find here. Some of the stories here here are regular events in Junction City (like the Light Parade) and are updated each time they occur. Others (like the day we moved the original Junction City jail) are one-time events. So grab yourself another cup of coffee or some bottled water and enjoy! This is surely one of the most popular annual events here in Junction City. 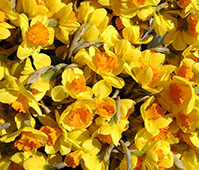 In fact, it's one of the most popular Daffodil Festivals in the whole country! The two day event features live music, food, crafts, and of course lots and lots of daffodils! The drive from Territorial Road along Ferguson Rd. to the end is filled with miles and miles of daffys! Function 4 Junction JUNE - Each year hundreds of classic and show cars parade through the center of town along Ivy Street - as hundreds of people line the streets. Here's a look at just a few of the great automobiles from this year's Function - and links to past year's Functions too! Ole Writes about Festival AUGUST - Our newly-arrived Scandinavian friend gets a surprise look at his first Scandinavian Festival. Halloween in Junction OCTOBER - The best of the best of Halloween porch and house decorations throughout the city. Light Parade DECEMBER - With Santa in the lead, the holiday season is begun with an evening fantasy of millions of lights parading down Hwy. 99. Includes archives of all past parades. Bill Stumps For Hillary Former President Bill Clinton in the J.C.H.S. gym! Beach Party Bash A beach party and volleyball game (with sand!) downtown. Vard's 90th Birthday A special celebration for a special resident. Moving the Jail Doesn't look much like a jail, but it was ours c.1920. Goodbye to Good Friends Two businesses close as the owners plan to golf more. Fire in the Pitney House Our volunteer Fire Department in action!